I was not allowed to sit for placements. Here's how an internship revived my career. I was not allowed to sit for placements. Here’s how an internship revived my career. About the Author: Mithu Roy completed B.Tech in Information Technology from B.P. Poddar Institute of Management and Technology. He shares how a meaningful internship revived his career when he wasn’t eligible to sit for placements. It all started as a bad dream. I couldn’t sit for any MNCs during campus placements due to my poor academic results. I had lost all my confidence and was sure that I won’t get any internship too. I used to visit Internshala frequently, but I had never applied for an internship. I was waiting for my final semester’s results when one day I finally mustered the courage to apply for internships. I was interested in the field of Mobile App Development. I had done B.Tech in Information Technology and so even though I wasn’t much interested in coding, I knew a little bit of everything. However, I had learned from the mistakes I made during college; this time, I wanted to be a specialist instead of a generalist. So, I did courses on Java, PHP, and web development. I learned Android Development for a whole month before applying for internships. I updated my resume and started applying. When I had to write why I should be selected for this internship, I talked about how interested I was in the field Android development and how I was doing a training on it. I got shortlisted for the company Eclectic Solutions and a face-to-face interview was scheduled. I was ecstatic and told my friends about this. On the day of the interview, I reached office before the scheduled time and came to know that my interview would be taken by the CEO himself. He: Why do you want to be an Android developer? Me: I have been using Android for more than three years, and I always used to wonder how applications worked. I even thought about the ways in which I could modify them. I have been working on Android for the past one month. Then he asked me about some Android concepts like Activity life cycle etc. He also tried to confuse me with trick questions, but I answered them correctly. The only question I didn’t answer properly was about ‘explicit intent’; however, I tried to explain and I knew he could see my effort. Then he asked me to create a sorting program using Java which I did on white paper and also answered his further questions on that program. He: So, your college didn’t organize any campus drive? Me: They did, but my CGPA was very low and so, I couldn’t sit for the campus drive. However, my marks did improve after 6th semester. He saw this, smiled, and said, “If you get selected…”. We shook hands and I was told that I would get the results in the evening. I came home, but I couldn’t concentrate on anything else. I was very excited and kept checking my laptop but I didn’t get any email. I started thinking that maybe I was rejected and that old feeling of despair started seeping in. Thankfully, after 11 PM, I checked my email on my phone and saw the email. I was selected! They sent me an offer letter which I gladly accepted. And the D-day arrived – 8th August 2016, the first day of my internship. I was excited and anxious at the same time. It was exciting to work in Sublime Text and FileZilla! I was provided a PC and asked to set up everything that I might need for the work. I set up Android Studio, Genymotion, etc. My first task was to create a portfolio app for the company after taking all the required information from the official website. I learned a lot while developing this app, mainly the UI stuff. As they didn’t have any existing project in Android, and I was the only Android Developer there, I had to create everything from scratch. This helped me master all the basics as I learned from my own mistakes. I got a good grip on databases and all the networking stuff too. On the last day of my internship, I asked the CEO why he had hired me despite my below average academic results. He said, “I don’t believe in a mark sheet. You were confident that day, performed well in the interview, and I could see that you had the ability and eagerness to learn quickly. So, I selected you.” I was really touched by his answer but I had understood this during my tenure there. This is why I recommend everyone to intern at a startup at least once. You are not judged on your stream or your mark sheet, you do important tasks that have an impact in real life, and you get to learn so much! I’m now working as a full-time Android Developer at another company called Codelogicx Technologies Pvt Ltd. 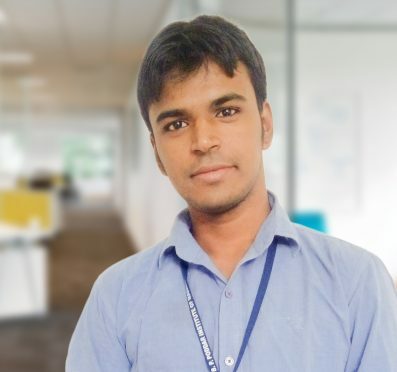 The experience I gained during my internship has helped me a lot in getting ahead in my career – by building both my technical skills and confidence. Whatever doubts I had in my abilities, this experience helped me overcome them. I did my internship after graduation, but I recommend everyone to do it while they are studying because the real, practical knowledge lies outside the confines of a classroom. Inspired by how Mithu turned the tide in his favor? Register and apply for similar Android internships and computer science internships – your dream career might be one internship away! From where did you do your Java, Web Development, PHP, Android courses?